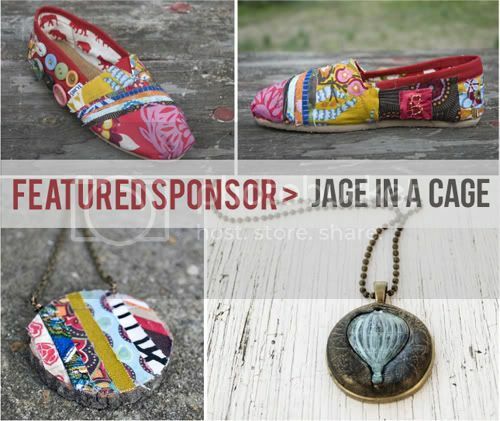 Our featured sponsor this month is Jage in a Cage - filled with fabulous jewelry made from all sorts of media: clay, wood, brass, recycled fabrics. I especially love the fabric covered tom's - you would totally stand out in these custom fabric ones! Please stop by & support Jage in a Cage! SOooooooo cute!! thanks for sharing! YES!!! Awesome shoes! Very crafty and unique. I will have to check out the blog. Omg I didnt READ the full posting, and I was going to say they look like Tom Shoes, and they are?!?!?! i've never really liked the line of TOMS although they have been growing on me. However, I adore these. I love the gorgeous fabric and how they are eccentric and eclectic. i love the striped wooden medallion!! !